This is a jumble of bits and pieces I’ve found in the past couple of months – mainly in my beloved charity shops. This year I seem to be swooning over different things from the last, but I guess this is ultimately a good thing - taste, circumstance and purpose can all change with season. 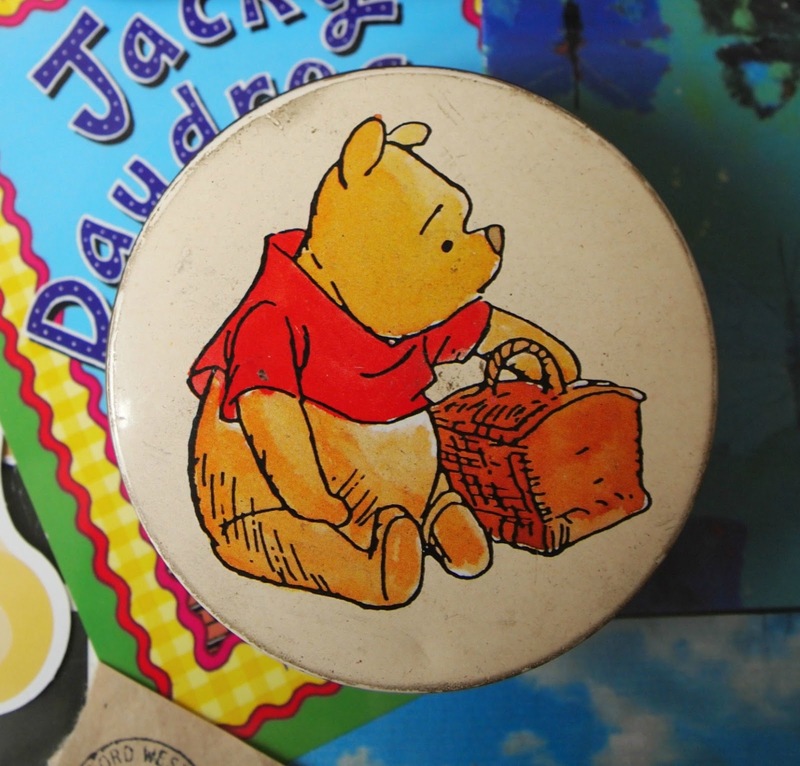 This Winnie the Pooh tin was a darling find in Ashbourne – in an antiques shop, I paid a little more than what I usually would, but I simple couldn’t resist Pooh bear and it will remain a fond keepsake. (Also coincidently – having being introduced to Pooh Sticks a day earlier by the girls, this was meant to be). Found in the children’s section, I couldn’t resist a second-hand Joules item (the first I’ve ever seen) and I adore the giant yellow button and cute embroidery detailing. 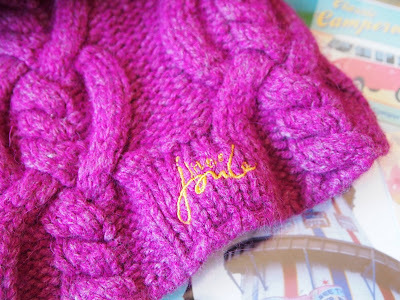 We all know kids have better clothing than adults, and I’m kind of lucky this one fits me. Quite simply the Beatrix Potter obsession will never go away. 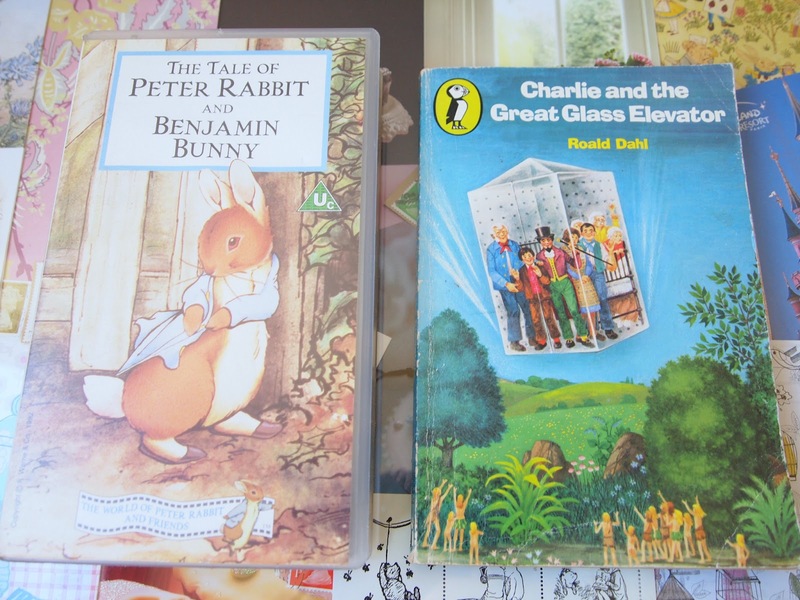 When I spotted this video of Peter Rabbit – I realised this is where it all began. Sitting down and watching this video almost 20 years ago made my heart melt. I had to buy this at 20p! And Simon managed to put it onto DVD for me which means next time I’m feeling sad, Peter will undoubtedly cheer me up. I’m always on the lookout for older versions of the Dahl classics, ever since watching a documentary about the author and this one certainly caught my eye. 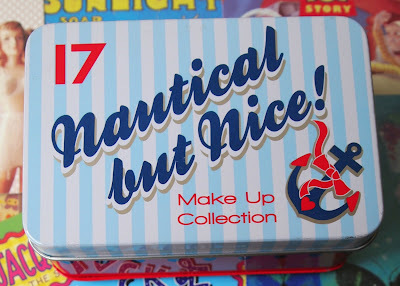 This ‘nautical but nice’ tin had caught my eye a few years ago in Boots – but I couldn’t justify purchasing some make-up for the sake of another freebie. I made a beeline for this in the charity shop, because I had always wanted it. I was sure it would be empty, but in fact came with its original contents brand new and untouched for 50p. I found this pillow slip stashed at the bottom of a box of duvet covers all by itself. 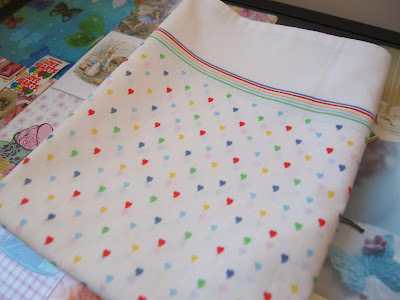 I wasn’t sure what I could use it for and almost left it behind, but I’ve since happily added it to my fabric stash. 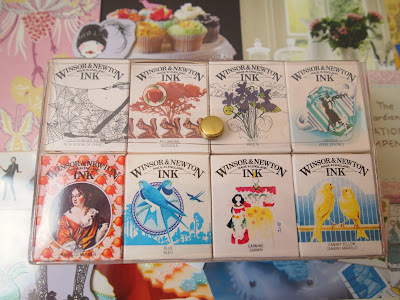 The funny thing is I’ve always wanted this ink set, for years now I’ve bought the inks I’ve needed separately, but have never been able to justify spending £15+ on a set of ink. When I spied it at a car boot sale I was unsure how much the seller would want, but when he said £2, I knew I had to have it. I wasn’t sure what condition the inks would be in, but I was more than happy to take the gamble. (Sometimes you have to). Later that day I found that most of the inks hadn’t been used, though the black one was nearly empty, but I have plenty of black ink anyway, so this doesn’t really matter! Plus I adore the packaging. A bit of a mixed bunch as always – but mostly small items, so no more cluttering up the house. Have you found anything interesting lately? Your a girl after my own heart with all those goodies - love seeing what other people pick up and source out when their vintage picking, because I always wonder why people pick up stuff that I don't! I love those pillows, I'd probably resize them into cushion covers as it looks so lovely and clean. 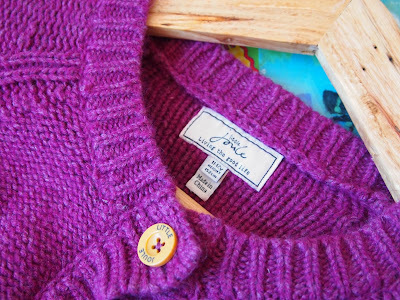 What lovely finds, that cardi is a gorgeous colour and I love the contrasting yellow button. Such good finds! <3 I'm always sucker for anything with good ol' Winnie on it too! That pillowcase is beautiful! I love the print! That box of inks is wonderful - what a find!